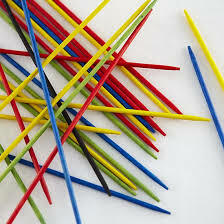 Pick-up sticks, or pattern sticks, are a neat way to do patterns using floats or supplementary weft. On rigid heddle looms they’re a way to introduce a whole range of different patterns and textures, including making “lace” and things like waffle weave. 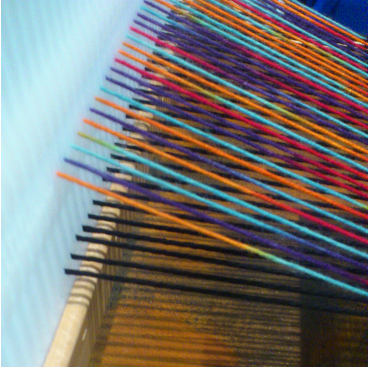 So, what are pick-up sticks in weaving? A flat stick that is wide enough to give you a useable shed, when inserted between warp threads and turned on its edge. Though my first pick-up stick was a spatula! (I was impatient to try the technique.) And many weavers repurpose stick shuttles for this. Stick inserted under the desired threads behind the reed. Stick turned on its edge. This should be hard up against the reed to get a good size shed in front. 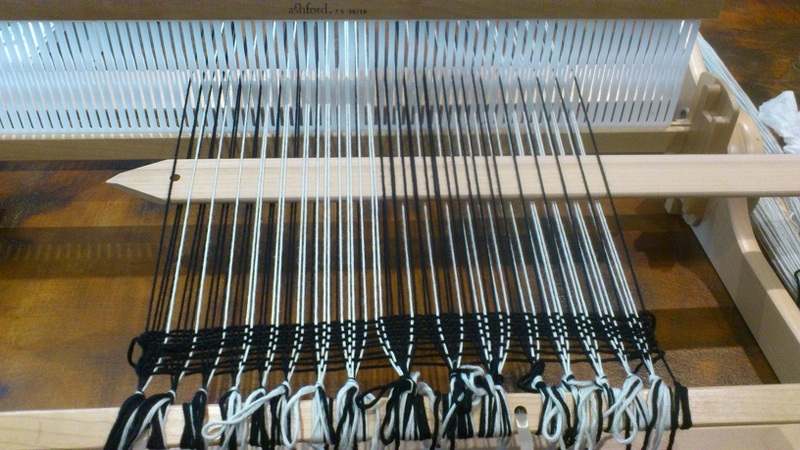 It is very easy to miss a thread when using pick-up sticks and I found it helped to put a piece of stiff paper – in a contrasting colour – under my slot threads, so I could see them clearly. Some people actually pick up in front of the reed/heddle (easier to reach), turn the pick-up stick on edge to create a shed and then insert a second pick-up stick into the shed behind the reed/heddle, finally removing the first pick-up stick. I must say it makes me nostalgic for the more commonly known kind of pick-up stick! 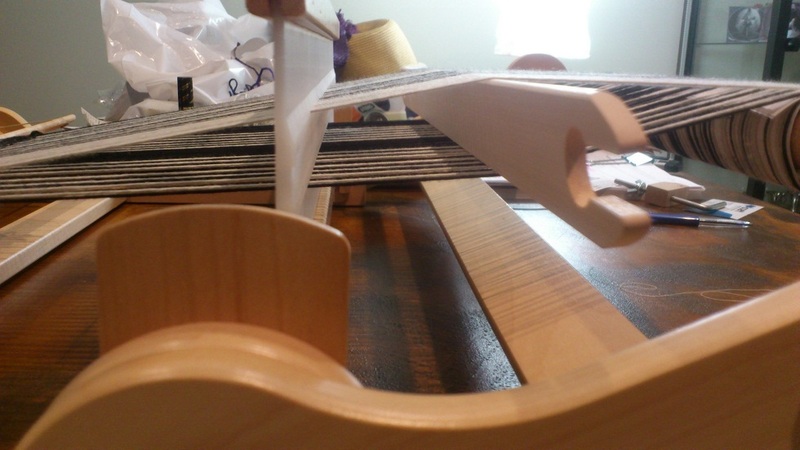 And now to those other shuttles… I use stick shuttles with my rigid heddle loom and, I may have mentioned I work with knitting yarns. This poses the question; how much 8ply can I and should I put on my shuttle? Well, in answer to the first part of that, I’ve discovered I can get an entire 50g ball of cotton – approx. 106 metres – on my big shuttle (56cm). The second part of the question can be answered with another question; how deep is your shed? I could just squeak that shuttle through the shed, so it worked out well. Pity I didn’t take a pic of the shuttle in the shed… ah well. I guess the final consideration for me in loading up my shuttle is that I don’t want too many joins in my scarfs, so I’ve tried to get as much on as possible! Also why I’m using my big shuttle even though I’m weaving much narrower pieces than that. Of course, I’m also weaving without a pattern here so I don’t ever know how much yarn the scarf will take. My last scarf, I ran out within about 15cms of the end, which was quite amusing. Over the last couple of posts I’ve talked a lot about warp. In this post I want to come back to weft and give it some overdue attention. For a start, how do we get our weft through the shed? 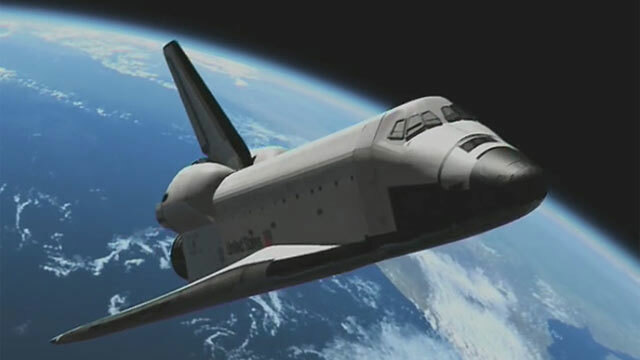 Well, you might remember this picture where there is a “shuttle” sitting inside the shed waiting to be used. The shuttle is like a bobbin or reel of yarn that you wind yourself and then for each “pick” (row) of weft, you move it through the shed. So, yes, I was making a pick pun with the title of this post. There are two basic shuttle types. The one above is a “stick shuttle”. You wind the yarn around it and unwind a enough for a pick or two as needed. If remembering to unwind a bit of yarn before you put it through the shed, isn’t your thing, then you have the boat shuttle. These have a reel/bobbin inside them and the yarn comes off it as required. Whichever type of shuttle you choose to use, you may have just one for a project, or you may have two (or more!) if you’re changing directions/yarns/colours in the weft. 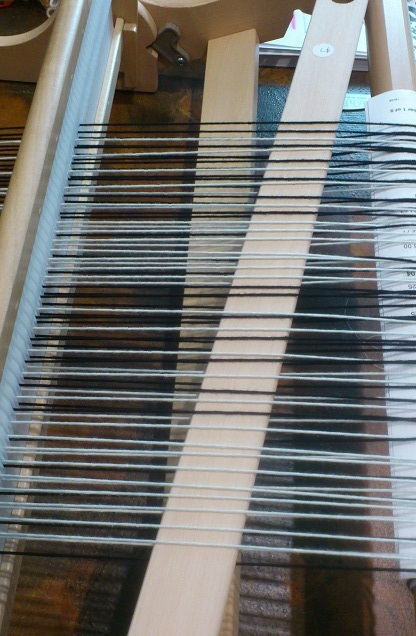 By the way, each row of weft can also be called a “shot” of weft. What is it with weavers and having 4 names for everything? !